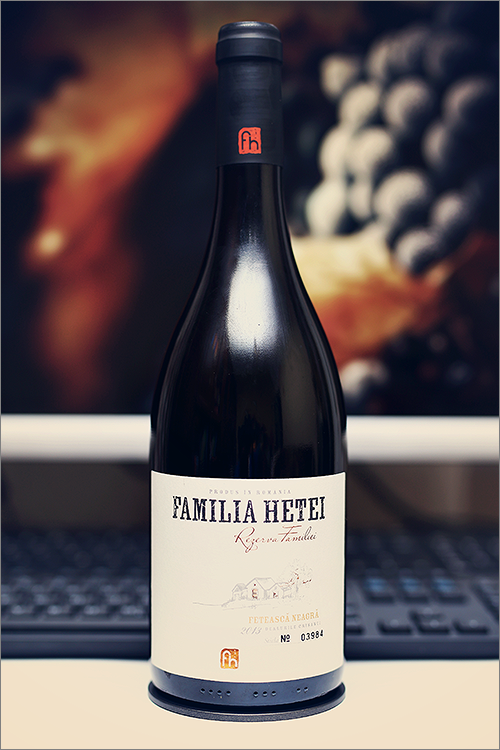 Tonight we are going to review a wine that is both, new and rare, as it was only recently released on the market – Feteasca Neagra Rezerva Familiei 2013 from Familia Hetei. This is an indigenous wine made of feteasca neagra grapes from the Crisana region in west Romania. This wine is part of the ‘Rezerva Familiei’ wine series, that is made of only the best estate wines, meant for long ageing and special occasions. Feteasca Neagra is the hero grape of Romania and it can produce wines that can stand the test of time, wines of the highest quality with strong character and nuanced terrior, thus representing the region it was grown in. Noble and transparent garnet color, with purple hues towards the rim of the glass. The nose is rich, filled mostly with black fruits: black cherry, blackcurrant, black plum, sour cherry, wood varnish, black soil and cherry seeds. An instant later the nose is filled with notes of black pepper, nutmeg, black tea, dust, roasted oakwood and some nuanced hints of tobacco. The wine is medium-dry, with light alcohol level, high acidity and smooth tannin. It feels wide, lean and opulent, with a medium and quite light body. This is a tart, woody and not very complex wine, as it tastes both, fruity and earthy at the same time. The wine has a fair overall balance with a nuanced tart accent. It has a medium finish and a balanced, bitter-zesty aftertaste. Conclusion: this is a light-body wine, that is not yet in its top form, but is clearly on the rise (maybe some 18 to 24 months will suffice), as it feels too young and too unbalanced at the moment. That’s why we would recommend to pair it with medium-rare cooked or sweet-meat dishes, like for example pan-seared sirloin steak or oven-roasted rabbit meat seasoned with herbs. The wine’s overwhelming acidity and smooth tannins will cut nicely through those fatty and rich elements in the dish, also, due to its indigenous origin, paring this wine with local cuisine may be an even better idea. Noroc!